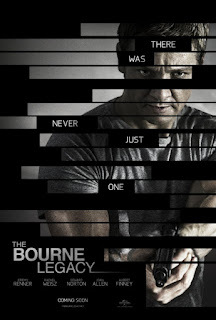 This is a serviceable continuation of the Bourne movie franchise. The film is good craftsmanship and in this day and age with budgets in excess of one hundred million dollars, the bar for even your standard "B" type of movie has been raised. All the standard action adventure ingredients are well on display: buff hero, an extraordinary skill set, and the requisite number of chase sequences all in the backdrop of a number of exotic and/or well known locales. The first three Bourne movies were based on novels written by Robert Ludlum and in each case; Tony Gilroy was co-author of the screenplay. In this fourth movie, the original story is by Tony Gilroy with him sharing the screenplay credits with his brother Dan Gilroy. While others directed the first three Bourne films, Mr. Gilroy took the directing helm for number four. One should note that Gilroy is not without directing credits having already directed Michael Clayton starring George Clooney and Duplicity with Julia Roberts and Clive Owen. Matt Damon is out and Jeremy Renner is in. 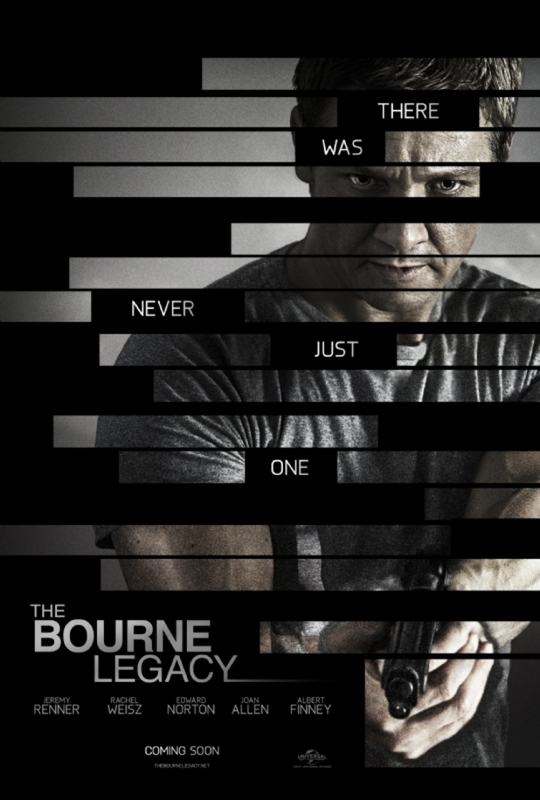 Will this be the start of Renner's career as an action hero? Renner did co-star in Tom Cruise's latest installment of the Mission Impossible series so maybe he is on the way up the ladder. As well as Renner, you can look out for other known names such as Rachel Weiz, Edward Norton, Joan Allen, Albert Finney and Stacy Keach. I'm not going to give you any spoiler alerts by recounting the plot, the twists and turns of the action, and the psychological motivation of the potential bad guys who are really doing the patriotic duty of any zealous government agent. No, I will leave that up to others or you can click on the Wikipedia link below. Rather I am here to tell you that this isn't worth shelling out the money to go to the movie theatre. It's serviceable but not necessarily worth the fifteen or twenty bucks unless you are a diehard fan. The following looks back at the entire series of films. The ratings of the first three films, based on Ludlum novels and starring Matt Damon contrast sharply with this fourth film. Is Bourne out of steam or is this merely a lull? This will make a good rental. I'm not saying it's a bad film, rather it's good craftsmanship. That essentially means if you're stuck in your timeshare on a rainy day and have nothing better to do, this won't be a waste of your time. However if you're thinking of forking over the small fortune one has to pay these days for not just the movie tickets but possibly paying a babysitter, parking your car somewhere, paying for movie popcorn and large drinks, and dinner if you're so inclined, I would say this might not live up to your expectations of what the return on your investment should be. I for one would like my ROI a little higher. It isn't quite as compelling as the earlier trilogy, but The Bourne Legacy proves the franchise has stories left to tell -- and benefits from Jeremy Renner's magnetic work in the starring role. The Bourne Legacy is a 2012 American action thriller film and the fourth installment in the Bourne film series, which is based on Robert Ludlum's Jason Bourne novels. It is directed by Tony Gilroy, screenwriter of the first three films and was released on August 8, 2012, in the Philippines and Singapore; August 9, 2012, in Hong Kong, Taiwan, and Czech Republic; August 10, 2012, in the US and India; and August 13, 2012, in the UK. The Bourne films are a series of action/thriller spy films based on the character Jason Bourne, a former CIA assassin suffering from extreme memory loss, created by author Robert Ludlum. All three of Ludlum's novels were adapted for the screen, featuring Matt Damon as the titular character in each. Doug Liman directed The Bourne Identity (2002), Paul Greengrass directed The Bourne Supremacy (2004) and The Bourne Ultimatum (2007). Tony Gilroy co-wrote each film and directed The Bourne Legacy (2012). The series is noted for its realism, in contrast to the growing use of computer-generated imagery in the action genre. Tony Gilroy: Fear changes everything. We're animals, and when we get afraid we act like animals. I'm not exempt from that. I was in New York on 9/11. We live in a fearocracy now.